The History Of MMA - The Macho Blog. While the term mixed martial arts is a more recent invention, multiple forms of mixed martial art have been around for thousands of years. Over 6,000 years ago in ancient China, soldiers invented an ancient style of wrestling and kung-fu that used a lot of the same grappling techniques that are used in modern mixed martial art. This ancient style of wrestling was called Shuai jiao. Another fighting technique that shared many similarities to modern mixed martial arts was the sport pankration in Ancient Greece. It too used grappling and striking techniques that mirror Shuai jiao and mixed martial arts. 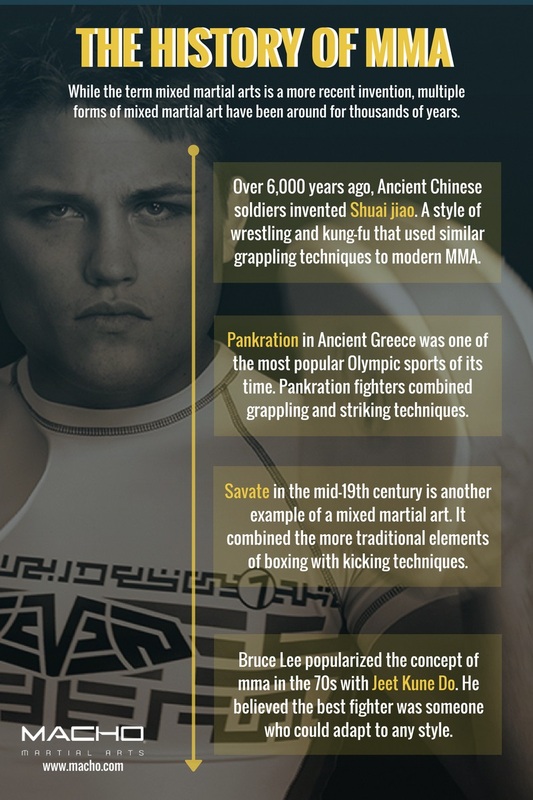 Unlike the ancient Chinese who used Shuai jiao as a military strategy, pankration fighters displayed their skills in ancient Olympic games. It was one of the most popular athletics of its time. Savate in the mid-19th century is another example of a mixed martial art. It combined the more traditional elements of boxing with kicking techniques.